Hello, I've been messing around with the Nolf 2 mappack a little and found a few bugs in there. Fixed missing textures due to special characters in severnaya bunker and Caribbean and added the emma peel map that was missing. The NSIS Installer will find the game and check for the old mappack and ask user to delete or keep it. NOLF 2 files for Mac. This is the NOLF2 port from Macplay. The anticipated sequel to the original game, No One Lives Forever 2: A Spy in H.A.R.M. 's Way is a humorous story-driven first person shooter featuring deadly UNITY operative Cate Archer. As Cate you must investigate a super-secret Soviet project that, if successful, could bring about a third world war. Armed with conventional and experimental weaponary and gadgets, you'll explore exotic locales, and contend with deadly agents determined to take Cate out of the spy trade once and for all. What harm does H.A.R.M. wish to inflict on secret agent Cate Archer? Find out in the sequel to one of the most highly acclaimed shooters of 2000. Agent Archer employs an vast arsenal of guns and gadgets - plus a wardrobe to die for - in challenging missions that span the globe. Powered by the new LithTech Jupiter System for the latest in graphic brilliance. Purpose: Allow players to join a server straight from the launcher without the need of other programs or scripts (e.g., Join By IP, xfire, Gamespy, batch file, ect.). Unlocked display resolution in display settings with auto FOV setting (widescreen support), no need to edit .ini files anymore. First time usage: After installing, start NOLF2 and select your display resolution from the Display page. General usage: Click the refresh button to download a server list and query servers, select a server and then Play (if the server is detected as locked, you will need to input the password). The launcher will load the correct mod for the selected server (if you don't have the server's mod installed, an error message will be displayed), if a server's mod is unknown, you will need to select the mod beforehand from the Custom menu. Credits: Luigi Auriemma - contains code from his GSInfo project. Purpose: Host games that self publishes to a server list used by Join By IP, LivesForeverPlus, Weapons-05b & URA's Multiplayer Launcher. NOLF2-Setup file. This file will extract the complete game (to C:\untyhq however the installer allows you to choose an alternative install path), patched to the English 1.3 version of the game. Additionally it has URA's Multiplayer launcher and the Livesforever and Liveforever Plus mods. finally it has the no-cd patch integrated into it. It also contains the latest dgvoodoo2 for additonal video settings. NOLF2-Setup-not-signed file. Is the same as the other setup file except it isn't digitally signed. This file will extract the complete game (to C:\untyhq however the installer allows you to choose an alternative install path), patched to the English 1.3 version of the game. 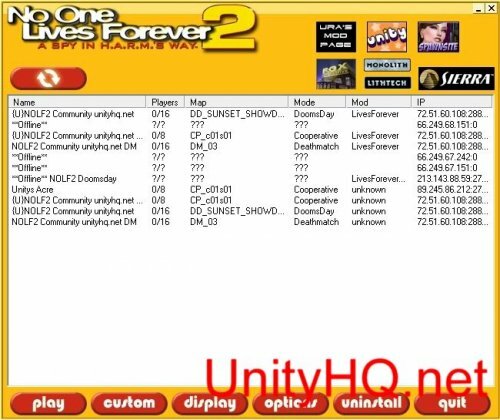 Additionally it has URA's Multiplayer launcher and the Livesforever and Liveforever Plus mods. finally it has the no-cd patch integrated into it. It also contains the latest dgvoodoo2 for additonal video settings. This installer (NOLF2-Setup.exe) has been digitally signed to make it easier to install on Windows 10. A non-signed version (NOLF2-Setup-not-signed.exe) for those having issues installing the signed version A zip file of the folder created by the installer for those who are having odd issues running the installers. If you download the No-One-Lives-Forever2.zip simply extract it to your C drive or Documents folder. Then right-click the NOLF2.exe file in the extracted folder and select send to desktop (create shortcut). Then double-click the desktop shortcut to play the game. Zip files of the 2 CDs for the No One Lives Forever 2 game (PC version original released version). The first two files in the selection are the disc 1 and 2 zip files. File 3 is the Nolf2-Setup.exe file. File 4 is the non-digitally signed version of the setup file (NOLF2-Setup-not-signed.exe) For those having problems with the signed file. Files 6 and 7 are the ISO images of the original CD media.